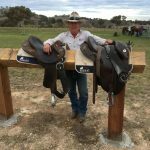 Weeroona is a local wool grower, and they have just donated some Angus Barrett saddle pads to Remount. Remount is rural Australian program assisting our veterans no matter where they live, and it is being generously supported by the rural industry. Thank you Weeroona.